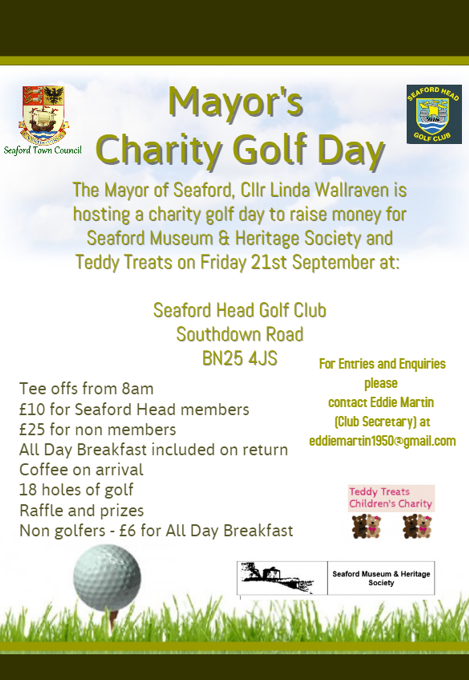 The Mayor of Seaford, Councillor Linda Wallraven is hosting a Charity Golf Day on Friday 21st September at Seaford Head Golf Club, Southdown Road, BN25 4JS to raise money for her 2 chosen charities; Teddy Treats and Seaford Museum & Heritage Society. Get your friends, family and work colleagues together for this enjoyable event! The Mayor is looking for local businesses to Sponsor trophies and donate raffle prizes, anyone who is interested is asked to contact Seaford Town Council on 01323 894870.